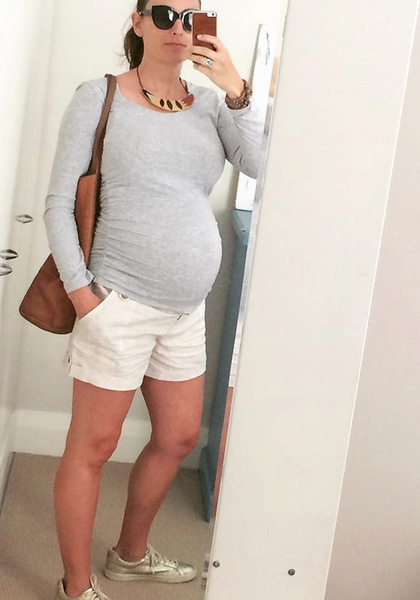 If you follow me on Instagram you'll have been seeing some of my maternity fashion looks over the past few months. I thought it was about time I compiled a list of shopping sites and labels that have helped me feel stylish without sacrificing my environmental and ethical values. But you'll also notice that I tried my best to wear things already in my wardrobe as much as possible - it's been a fascinating journey for this sustainable fashionista! One of the first things I bought was a Belly Belt, which let me keep wearing my favourite Agolde jeans for months. There are two different sized belts, both with multiple hooks/button holes, to keep you in your favourite clothes throughout your pregnancy. You just need to make sure you have shirts that hang low enough to cover the belt. Designed by an Aussie - nice! - but also available in the US and the UK. Here you can see how I've used the Belly Belt for months. In the photo on the left I'm wearing my perfect white shirt from slow fashionistas Good Day Girl, layered with a long tee by Amour Vert. On the right, I've paired my Belly Belted jeans with a wrap dress I've owned for over a decade and my fave black KITX blazer. No fabric is perfect, but I typically avoid bamboo because often the process of turning hard bamboo into soft fabric uses a large amount of chemicals and the production often isn't highly regulated (and don't believe those "anti-bacterial" claims of this fabric, either). However, there are many sustainable benefits to the fabric, like using significantly less water than cotton, requiring no pesticides and being fast growing compared to the other trees often used to create viscose (bamboo fabric is technically viscose). And for anyone who has ever worn it, you know how comfortable, soft and breathable bamboo feels on your body. So...I have made some exceptions for my maternity wardrobe, as this seems to be a "sustainable" fabric of choice in this market. 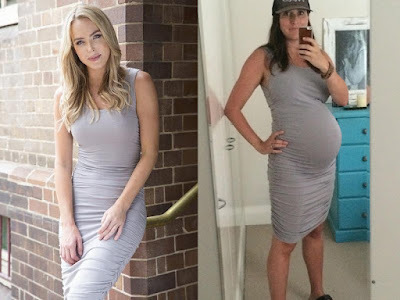 This ruched, bodycon dress was one of the first pieces I bought (purchased from Glow Mama) and has lovingly stretched along with my growing bump. And I guarantee I will keep wearing it post-pregnancy, it's just so comfortable and easy, definitely going to hit at least 30 wears. I also bought this Bamboo Body long-sleeve top at the same time, and again, I'm sure I'll keep wearing it. The shorts were purchased from online shop Milk & Love, and are 100% linen - heaven! Accessorised with Veja sneakers, Sseko natural leather tote ethically made in Africa, Toms one-for-one sunglasses and a necklace made from an upcycled skateboard deck. I already knew about Sorella because they offer a range of beautiful organic cotton pajamas and lingerie, and they also have a maternity line. I bought myself this beautiful lavender nightie, which will be great for nursing, too. 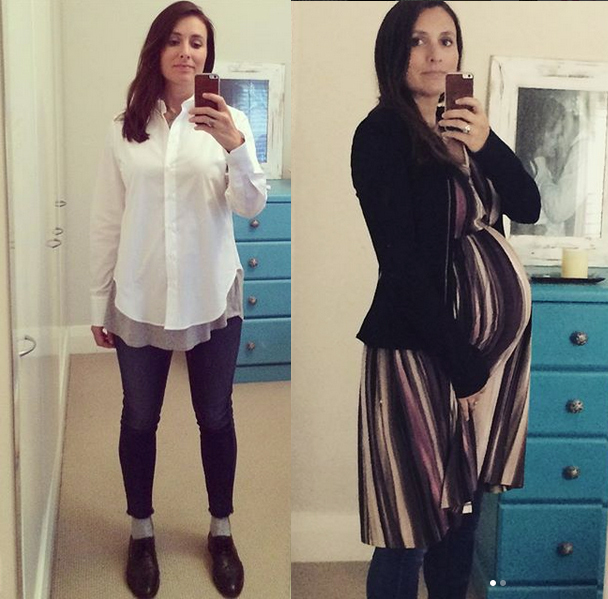 Not technically a maternity label, but one of my favourite ethical labels, and many of the items I already had in my wardrobe by Amour Vert helped me look and feel like myself as my belly grew. This navy and white striped dress has been in my wardrobe for about four years now, and was the perfect dress for warm winter days and worked well into spring. This sweater/jumper was a great option for early pregnancy days, as it allowed my little growing bump the space it needed to grow without showing it off too much (this photo was taken for a University of Sydney marketing campaign when I was about 4-5 months pregnant - great fun to walk through the mall having my photo taken, with shoppers looking at me intently like, "Is she famous?!" Nope - just passionate about sustainable fashion). And this off-the-shoulder top is made of linen and is keeping me cool as the days heat up (though is just about too small to fit over my 8 month (plus!) bump). Incidentally, this photo was taken before I'd fully turned my office into a nursery - another blog post coming once that project is done. 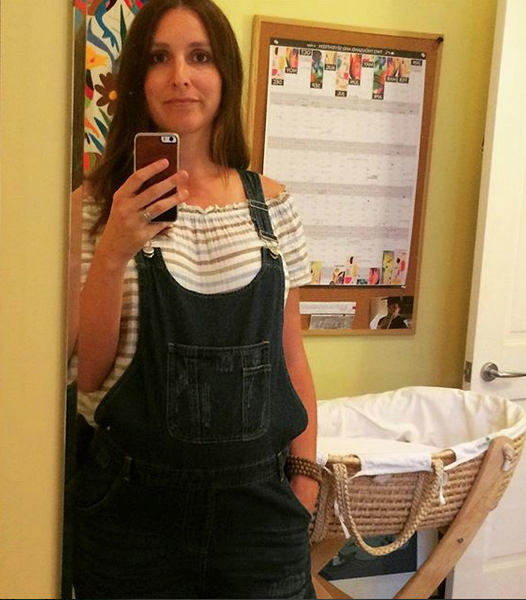 The overalls were a specific maternity purchase, and I fully admit there is nothing inherently sustainable about them. However, I have definitely worn them at least 30 times already, and hope to sell them/pass them along to another mumma-to-be when I'm done. I have practically lived in this dress from All the Wild Roses, and cannot believe I have ZERO pregnant photos of me in it - so instead I'll show you the non-pregnant version and you can use your imagination. Perfect empire-waist, boho-inspired, airy for summer and easily layered for winter. I am so in love with dress, and confident it's well-beyond 30 wears since I bought it last summer, and is still going very strong. I have enjoyed this website for buying a number of items like a belly support band made of organic cotton, bamboo maternity and nursing sleep bras, organic tanks and tees. Not everything on the site is sustainable, but I was able to find a number of small essential pieces, which made me happy. Though not strictly "sustainable", these Made in Australia leggings from The Ten Active have been a saviour for my yoga practice. I kept wearing my usual leggings as long as possible, but as soon as I slipped on this pair of leggings I was in heaven. I felt at once supported and free to move in all the positions my body is craving. I have practiced yoga for almost two decades (wow!) and having comfortable yoga wear is essential. I'll probably keep wearing them afterward because you can easily fold down the maternity support top, they are incredibly high quality, extremely comfortable, and I love the colour. Each purchase also supports the Humpty Dumpty Foundation, a children's hospital charity. OMG - I can't believe it, but I admit I bought some items from H&M. They have a "Mama" range, and I bought a couple organic tees that had a bit of stretch to go over my bump, too. I have such mixed feelings about H&M's sustainability claims, but I wanted to be honest with you all and let you know I did enjoy being able to buy organic cotton maternity tops for a reasonable price from this fast fashion behemoth. I'm wearing a 3/4-length sleeve black top with my overalls in the photo below, and paired with a vintage head scarf and my favourite Birkenstocks. Secondhand clothing has also been essential in this journey. I relied on secondhand clothing from a dear friend, who gave me three pair of maternity pants that were so helpful in the winter months, as well as some extra t-shirts and a dress. My mother-in-law kindly bought me a few pieces from a secondhand maternity clothes sale in her hometown. I bought a dress for my baby shower from eBay (see below), and a pair of dress maternity pants from ThredUp. Overall this maternity wardrobe of mine is a real mishmash of new sustainable items, pre-loved items, some pieces from my own wardrobe, and a few non-sustainable items. As many of you would know, dressing your pregnant body is an unusual experience. You are constantly growing, but slowly so you don't realise how much your body really is going to change. I thought I'd be able to get away with a lot more clothes from my wardrobe, but I really couldn't as my body changed over the past 8 months. It's not just the bump, but my breasts have grown, my hips and thighs, too, and certain dresses I thought would definitely last throughout my pregnancy were outgrown months ago. It's an excellent practice in letting go of control, especially for someone like me, who likes to have full control of not just the style of my clothing but the sustainability credentials, too. I think I've done pretty well, though there were certainly a few early purchases that were not right (hello see-through leggings and non-supportive sports bra! ), but I've also had a lot of fun dressing this version of myself. If you have any other tips for sustainable mamas-to-be, please share! My number one tip - when in doubt, ask Google, and you'll be led to some incredible online shops.